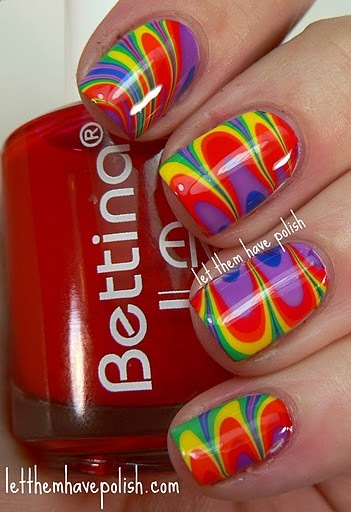 Please enjoy this guest post by my totally talented friend Cristina from Let Them Have Polish! Look at me!!! I'm on Also Known As... Are you kidding me?! Anywho.. Now that I've got that out of my system I do have to say how excited and flattered I am to even be here with you guys today!! For this post I wanted to do something really special. So I decided to put on my big girl pants and watermarble! Last time I watermarbled was when I guest posted on the lovely Glitta Gloves, who was just on here recently. 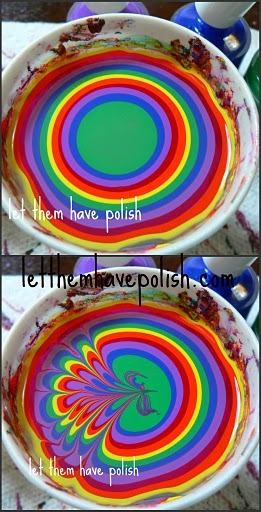 See I normally save watermarbles for special occasions and this is definitely special :). I won't blab much and just get to the pictures! I went with a rainbow lollipop theme! I freaking looooove this sooo much! Don't they look like candies? I basically created my own version of Color Club's latest PRIDE Collection release out of my Bettina polishes and just went for it! I have to say I am so beyond happy with how this turned out. They are not perfect but they are colorful and even though Pride month has passed I say who cares! Rainbows for everyone!! All of this was done on a base of two coats of Bettina's Candy Marshmallow. This is the most wearable White ever. It has just a hint of Pink. This color also has the most effortless formula, only needing Two coats to be fully even and opaque. I could have done with One coat since I was just using it as my base but I wanted to show you a swatch of it so I did Two coats. Also this is without a top coat! I love how shiny my Bettinas are. Just for fun here is a pic of what the cup looked like. Soooo pretty! I just wanted to keep swirling the colors around. Also those of you wondering about Bettina polishes. They are a Puerto Rican brand of cosmetics with great nail polish and you can purchase them directly from them by sending an email to janetmrosado@gmail.com (Rosama Distributors-authorized distributors Bettina cosmetics). They are really great about getting back to people wanting to purchase in the U.S. I hope you guys enjoyed this post as much as I enjoyed working on it for you Kellie-fans!! This has seriously been a blast! Holy WOW this is truly amazing, I was beginning to think my site would never feature a watermarble, cuz I'm so damn bad at them, but now that dream is a reality! Thank you so much for sharing this amazing post with my readers C!